EncSpot Pro reports useful facts about your MP3 collection. It is able to guess which encoder was used to encode each file. It will also give you a general idea of the audio quality of the file. For files encoded with Lame, EncSpot can read the 'Lame Tag' and provide detailed information on the switches used when the file was encoded. Note: EncSpot Pro is payware turned freeware. The author has discontinued development for the program, and has graciously decided to release the full version for free. The domain is not available anymore. Maybe there is another download link available? You can google for it or download it from here: http://www.mediafire.com/?ytxzqotfjtn (just unextract the archive and Launch encspot.exe ...and no I did not tamper with anything, I use it on my own machine, so it's safe as far as I know) hopefully Andrew can host the archive? This application is also hosted at the InternetWayBackMachine. here is a direct download for the app. 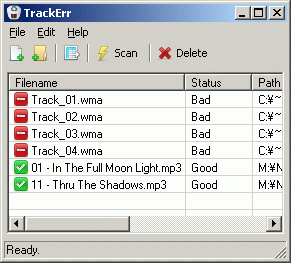 TrackErr quickly finds audio files with digital rights management (DRM) that prevents the files from playing on your system without a service connection (like iTunes or Windows Media). If you lack the credentials to play these files or their remote management services have gone offline, these files are just taking up space. Features a drag and drop interface and can export all/selected rows to a spreadsheet (CSV). How to extract: Download the ZIP package and extract to a folder of your choice. Launch TrackErr.exe. Audio Identifier is a audio file inspector. You can browse your audio collection via an Explorer-like interface and it will show you detailed information about each audio file, such as average bitrate, used encoder and settings, guessed quality etc. Perfect for audiophiles that want to know exactly what kind of quality they have. If you know the difference between xing (crap) and LAME (good) encoders, this program is essential. Also great for looking at duplicate files to see which one you should keep - file size isn't always the best indicator to quality. Don't know your formats (ogg, flac, wma, mp4, etc?)? This program can help educate you.